When given the option of what to eat for dinner, I'll usually decide on a pasta dish with a variety of vegetables or even a homemade pizza with yummy toppings, but every once in a while, I like a good, juicy burger. This recipe, by my favorite chef Rachael Ray, is not only delightfully satisfying for your taste buds, but it is one of the best recipes I've yet to make. You must give it a try. Pre-heat oven to 375ºF. 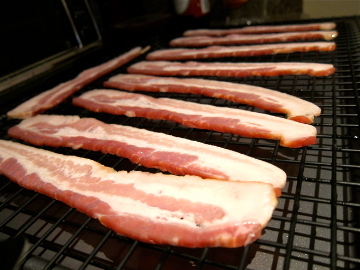 Place the bacon on a rack arranged over a baking sheet and bake until crisp; reserve. Combine oil, turkey, garlic, grated onion, cumin, coriander, salt and pepper in a bowl. 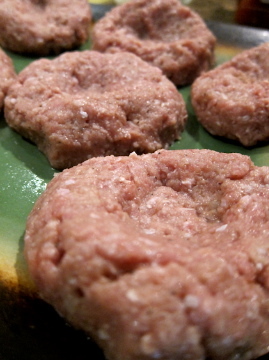 Form six large patties. 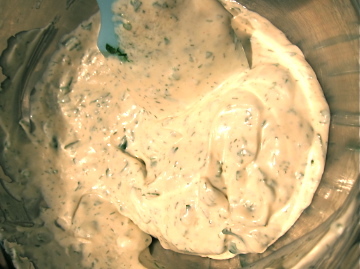 For the ranch dressing, combine the sour cream with lemon juice, hot sauce, herbs, salt and pepper. 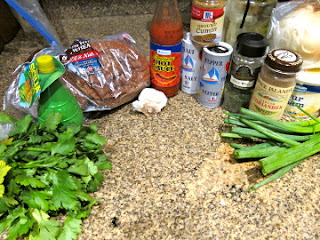 Taste to adjust the seasonings. 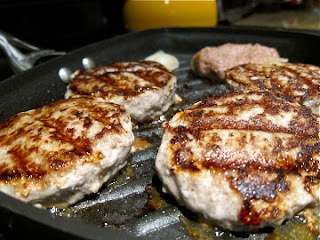 Heat a griddle, grill pan or cast iron pan over medium-high heat (I think the burgers were so juicy because I cooked them on a pan instead of the grill.) Cook large patties for 5-6 minutes on each side, or slider patties for 3-4 minutes on each side. Looks delicious. I definitely need to invest in a griddle pan.